As your little one grows, he’ll develop a sense of morality—those principles that affect how he treats other people and how he views justice. His core beliefs, temperament, and life experiences are just a few things that will influence his sense of morality. Every day, your preschooler is surrounded by people and situations that will guide his moral development. Whether it’s another child on the school playground or a plot line on a favorite TV show, his experiences shape his views. As a parent, you probably want to have some influence on how he develops his sense of right versus wrong and instill the values that you deem to be important. 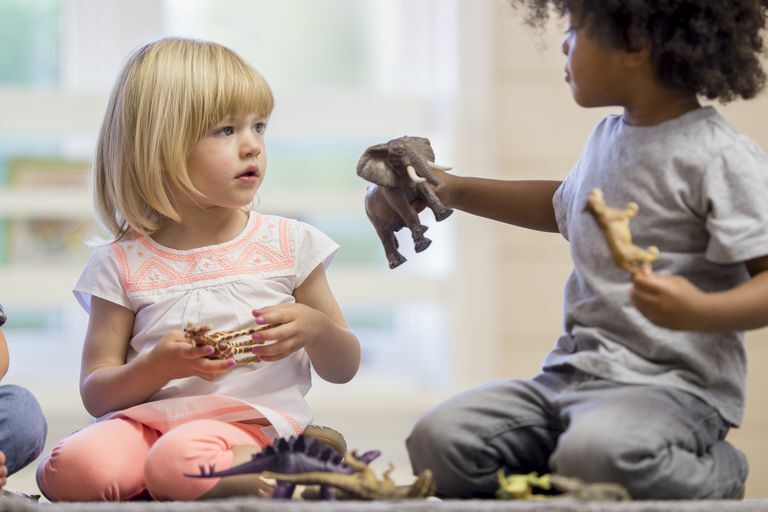 However, it’s not always easy to know what’s age-appropriate when it comes to guiding your child morally—or even how to start. Around age 2, children start to feel moral emotions and understand—at least somewhat—the difference between what’s right and what’s wrong. Toddlers and preschoolers are motivated by the threat of consequences. Therefore, early on in their moral development, you might see that they’re more concerned about being punished rather than the feelings of another person. Your child might also start to show signs of empathy, however, if he sees another child who is upset. But empathy often doesn't develop until closer to age 4 or 5. Don’t worry if your toddler doesn’t seem to care if he hurt someone. With some guidance from you, empathy will come in due time. Do I share my toy with a friend even though I don’t want to? Do I hit the person who won’t play with me? Should I take my sister's toy from her because I want to play with it? Do I cut in line because I don’t want to wait my turn? Do I sneak a cookie when Dad’s not looking? While your child will violate your moral codes quite often, each time he steps out of line is an opportunity to help him learn. The discipline strategies you employ, combined with the proactive strategies you use to teach him right from wrong, will guide your preschooler’s moral development. Research shows kids begin to understand the 'moral of the story' around age 5 or 6. But, preschoolers are less able to grasp a life lesson from a story about someone else. The concept is too abstract. So it's important to be very concrete about morals. Say specific things like, "We don't take other people's belongings because it's wrong to take things that don't belong to us. It hurts other people's feelings when we do that and our job is to be kind to people, not hurt them." As your child's understanding of morals increases, begin to ask him to identify the life lessons in a story. Read books and watch stories with various moral lessons and check for your child's understanding of how he can generalize that lesson to his own life. Additionally, monitor closely what your child is exposed to. TV shows, books, or video games that violate moral codes without teaching a lesson may have a negative influence on your child. Shame stems from thinking, "I am bad." Guilt stems from thinking, "I did a bad thing." As a parent, you want to guide the child into feeling guilt rather than shame. A child who feels guilty may recognize she's still a good person who is capable of making better choices in the future. Guilt is a normal, healthy reaction. It means your child regrets what he’s done—and that can motivate him to make amends. Guilty feelings may also prevent him from making the same mistake in the future. Shame, on the other hand, may cause your child to believe she’s incapable of doing the right thing. And it may take a toll on the decisions she makes in life. A child who feels shame, for example, may not resist peer pressure or may not stand up for herself when her rights are violated. As a parent, you can influence whether your child experiences shame or guilt after he makes a mistake. If you express anger at your child or become standoffish, he’ll be more likely to feel shame. Make it clear that feeling sad, mad, excited, or any other emotion is OK. But hitting people, calling them names, or treating them poorly isn’t acceptable. Be on the lookout for times when your child decides to share, console someone else, tell the truth, or help others. Praise your child for exhibiting those prosocial behaviors. When you point out positive choices, your child will become more motivated to keep up the good work. Your child won't be able to understand other people's feelings and how his actions affect others until he has a clear understanding of his own feelings. Use feeling words in your everyday conversations. Label your child's emotions by saying things like, "It looks like you feel angry right now," or "I understand you are sad that we can't play outside right now." When your child understands his emotions, he'll be able to start understanding that other people have feelings too. And you can begin talking about how his behavior influences how other people feel. While your little one may not fully grasp the concept of empathy, it's never early to begin teaching teaching your child about other people's feelings. Ask questions, like, "How do you think your friend feels when you don't share?" or "How do you think that boy felt when you hit him?" Help your child label the emotion. To really reinforce the point, ask your child to show you how the person might feel. When your child makes a sad face to reflect how another individual might feel after getting hurt, he’ll actually feel sad for a second. That can reinforce to him that other people have emotions too. As the saying goes, practice what you preach. If you don’t want your children to tell lies, role model honesty. Even if you think it’s a little ‘white lie,’ your child will think dishonesty is OK. Your child will learn a lot more from what you do, rather than what you say. So make sure your actions match your words. As long as you accompany them, your preschooler can volunteer and help others in a variety of ways. Whether you feed cats at the local SPCA together, or you collect canned food to donate to the food pantry, emphasize the importance of making the world better. Even simple acts of kindness go a long way in developing a good moral sense. For example, make a “get well soon” card together for a neighbor who’s feeling under the weather. Then, deliver it together with a Tupperware of chicken noodle soup. Everyone makes mistakes, so it’s important to make sure your child knows that it’s OK. However, you can’t just let it go—hold your little one accountable. Verbalize why his behavior was wrong when he makes a mistake. Say, “We don’t hit people because it hurts their feelings and their bodies.” Then, give him a consequence, such as placing him in time-out or taking away his favorite toy for the afternoon. Forcing him to apologize isn’t likely to be helpful. He may not actually feel sorry so telling him to apologize to his brother may just be lip service. Remember, guiding your child’s moral development isn’t something that happens in just a couple weeks. This will be a process that will last long into your child’s elementary school years and beyond. There will be times your child will make mistakes that make you wonder if anything you’re doing actually resonates with him. Don’t worry—he hears you. With consistent guidance from you, he’ll develop a clear moral compass. Buchsbaum D, Gopnik A, Griffiths TL, and Shafto P. "Children’s imitation of causal action sequences is influenced by statistical and pedagogical evidence." Cognition120, no. 3 (2011): 331-40. Rizzo, MT., Cooley S, Elenbaas L, and Killen M. "Young children’s inclusion decisions in moral and social–conventional group norm contexts." Journal of Experimental Child Psychology, June 2017. Walker, CM., and Lombrozo T. "Explaining the moral of the story." Cognition, December 20, 2016. How Do Preschool Teachers Evaluate a Child? Does Your Preschooler Get Enough Exercise?